UPDATE: The full cabinet and playfield have been revealed! Click here! Stern Pinball just confirmed that the rumors of a new TRON pinball machine happen to be true. They’ve been teasing it for months now on their Facebook page – asking people’s thoughts about Tron and showing a picture with some engineers toying around with some blue EL wire. This is the first picture from the prototype playfield but still doesn’t tell us much about whether the game will include elements of both Tron films or just the most recent one. Either way, this excites me more than any Stern pinball machine in a while so I hope it’s good. 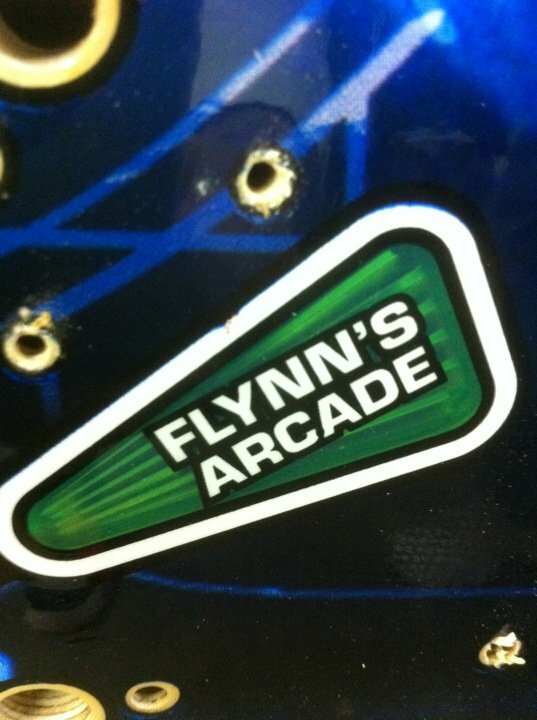 This also will mark the first time Tron will return to arcades since the mid-80’s(where it should be really). As there was no coin-op video game release based upon the Tron Legacy film that just came out, a pinball machine based upon that is certainly the next best way to get there. As I have told many of you when we have been together, Stern Pinball will begin production of its next model pinball machine, TRON: Legacy, at the beginning of May. You will receive TRON in time for your pre- summer season sales. We have licensed this title from Disney, the maker of the $400 million grossing holiday season movie TRON: Legacy. 60% of the gross was outside the United States. This movie is an extension of the 1982 movie TRON and the famous video game of that time. Another TRON movie is being planned. We have had requests from gamers, and pinball players in particular, to make a TRON pinball machine. There is a pent up demand for this game, and many of you have heard this from your customers. With TRON, we continue the design philosophy that you have told us has been successful, that of Iron Man, Avatar and The Rolling Stones. Our games are playing shorter and have more randomness. The great designer Harry Williams used to say, “The ball is wild.” Great players are challenged and causal players have fun. Operators are making money. Our TRON pinball puts the players in the middle of TRON movie and video game action battles. This is a fast moving game. TRON has 3 flippers, including an upper flipper to shot one of the two fabulous fast action ramps. We have not utilized a 3rd flipper in a while, and players will enjoy it. In the center of the playfield, near the top, there is a motorized 3 bank target assembly the player must hit and lower, to gain access to the illuminated, motorized spinning disc, representing TRON’s Identity Disc. The spinning disc shoots the ball randomly across and around the playfield. Ramp shots take the player to an exciting Light Cycle multiball. The player shoots at the miniature TRON video game to start exciting features and collect big points. TRON: Legacy is a visually exquisite 3D movie, and our pinball has captured the same exquisite visual, including its 3D backglass. Music is from movie and perfect for pinball. This game is brought to you by the design team that gave you Iron Man and Avatar. Because this is truly a collectors and enthusiasts dream title, we will make a TRON Limited Edition version in late June. As soon as Disney approves the game photo, I will send you a picture for posting. I would have to say that them not releasing a Tron Evolution arcade game simultaneously with the movie was a huge missed opportunity. It really made no sense to me. Well,Stern might not have known about the movie early enough to be ready with the pin at the release of the movie. I’m just happy they are releasing one now…. I hope it’s good so it can be my first NIB pinball game. It’s a lot of money though. it’s crazy to buy a Stern pinball without playing it first. different people like different things in a typical pin. there should be a lot of these for sale around september, at a price savings. i’d wait…well, i’m going to wait. the limited edition doesn’t even add anything an average pin owner couldn’t do with about 6 hours of work. i don’t think it justifies the high price tag. i’ll be happy with a PRO model…but i’m playing it first. i HATE the rollng stones layout. just sayin’.